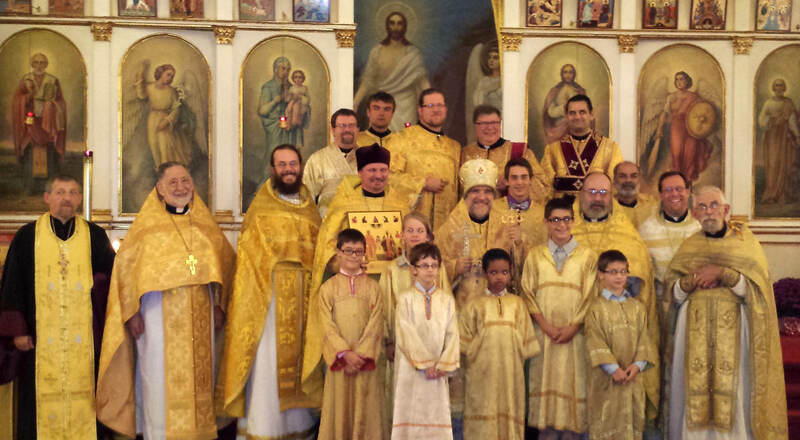 It was a glorious weekend, 27-28 September 2014, at Saints Peter & Paul Orthodox Church in Buffalo NY. 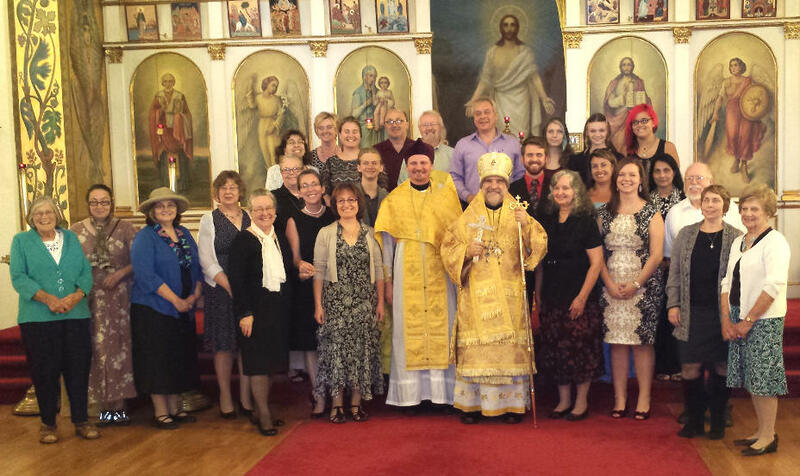 Many guests and visitors from neighboring churches joined Father Volodymyr Zablotskyy (parish rector) and parishioners in celebration of the 120th Anniversary of the oldest Orthodox Church in Buffalo and the “senior parish” of the Diocese of New York and New Jersey. Following the celebratory Hierarchical Divine Liturgy on Sunday, a festive banquet took place at Creekside Banquet Facility in Cheektowaga NY. The 120th Anniversary celebrations began with Great Vespers on Saturday, 27 September, celebrated by local clergy and Bishop Michael. It was followed by a social reception and fellowship in the parish hall. In his homily, His Grace exhorted the faithful of the parish to continually make the light of Orthodoxy present in Buffalo NY. The Divine Liturgy on Sunday, 28 September, began at 9:30 a.m. with the greeting of the Bishop Michael by the youth of the parish and Father Volodymyr. A combined choir of singers from Orthodox parishes in Buffalo, under the direction of Linda Mucyn (parish choir director), sang and led responses during the Divine Liturgy. At the conclusion of the Divine Liturgy, the choir was exhorted and honored by Bishop Michael for the beautiful singing; the clergy and faithful responded by singing “Many Years!” to the members of the choir. During the Divine Liturgy, Father Volodymyr was awarded the Nabedrennik (liturgical shield) and purple Skufia (honorary headpiece) by Bishop Michael. Following the celebratory Hierarchical Divine Liturgy, a festive banquet took place at Creekside Banquet Facility in Cheektowaga NY. Visiting clergy participating in the celebrations included: Father Alexey Karlgut (Saints Peter & Paul Church, Endicott NY), Father Jason Vansuch (Saint George Church, Buffalo NY), Father Yuriy Kasyanov (Holy Trinity Ukrainian Orthodox Church, Cheektowaga NY), Father John Boddecker (Saint Theodore Church, Williamsville NY), Father Herman Schick (attached to the parish), Father Stephen Janos (retired, former parish rector), Father Michael Zaparyniuk (Saint Herman of Alaska Church, Lake Worth FL), Deacon Mark Hoeplinger (Saint George Church, Buffalo NY), and Deacon Andrew Hammond (Saint Theodore Church, Williamsville NY).